East-Central Arizona. Navajo County. About 43 miles (69 km) east of Flagstaff (Exit 233, I-40). Closet City or Town: Winslow. High desert country at an elevation of about 5,709 feet (1,740 m) above sea level. Not a National Monument or a State Park (but would desire such a protective status). Cavernous (so-called impact) crater made by a cosmic visitor’s sudden noisy and fiery arrival. Quartz-bearing rocks severely shocked by extreme heat and overpressure. A private enterprise site hoping to get funded and protected. Focus: recent human history, speculation, meteorites, and geology. 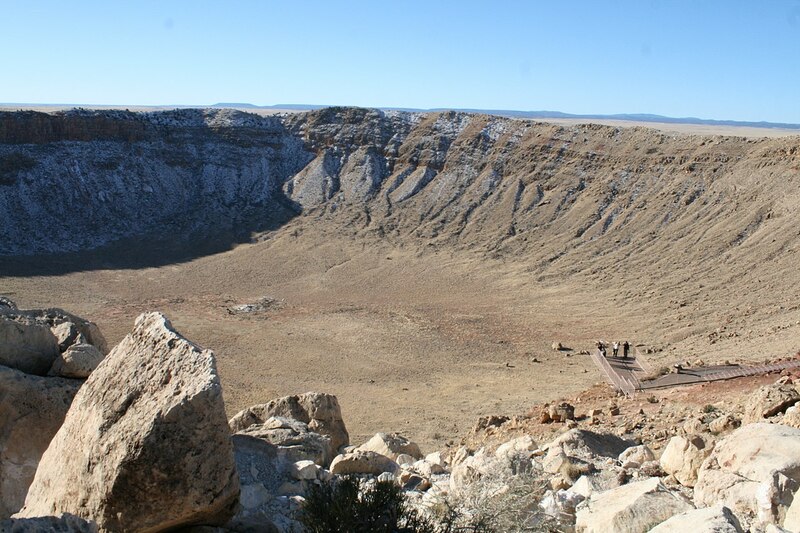 Some 50,00 years ago a large meteorite slammed into the landscape (the future State of Arizona). 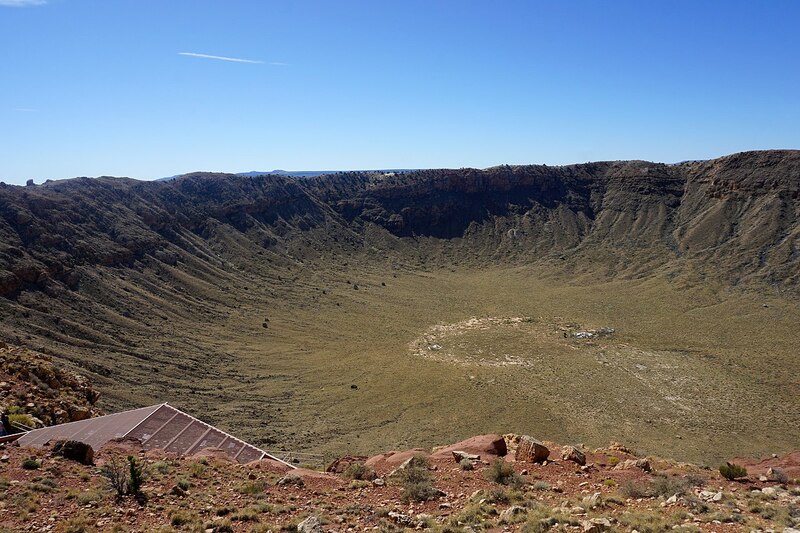 The impact left a gaping saucer-shaped crater 3,900 feet (1,200 m) in diameter, some 570-feet deep (170 m), and surrounded by a rim that rises 148 feet (45 m) above the surrounding plains. I was a great big noise in tandem with a brilliant explosion heard and seen for hundreds of miles around. Of course, there were no humans around to witness such a startling event. Today, the preserved impression remains a significant and altered topographical imprint due to the typical arid climate of this region. Desert environs also tend to preserve rather than erode or fill. Through the years, this sizable impact crater has been called by various names: Canyon Diablo Crater (Devil Canyon), Canyon Diablo Meteorite, and Barringer Crater. 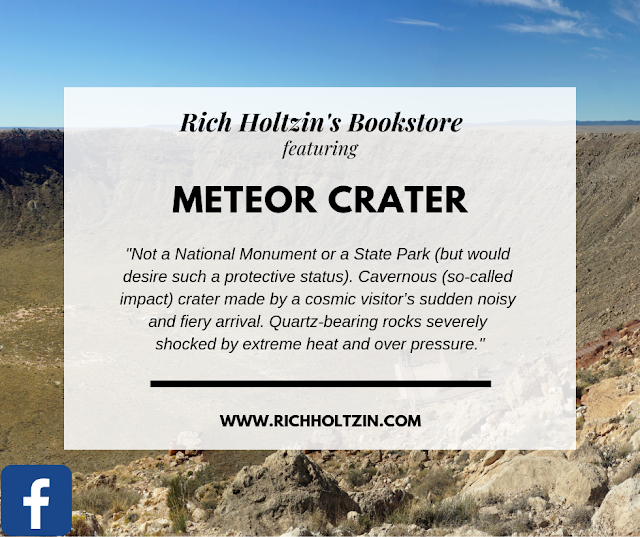 Modernity’s designate, Meteor Crater, traces to a regional and former Arizona Post Office named Meteor. This anomaly from outer space left its astral hallmark about 3.5 miles/5.6 km west of Devil Canyon. Daniel Barringer was the first to suggest the aberrant extraterrestrial footprint had been produced by a meteorite. 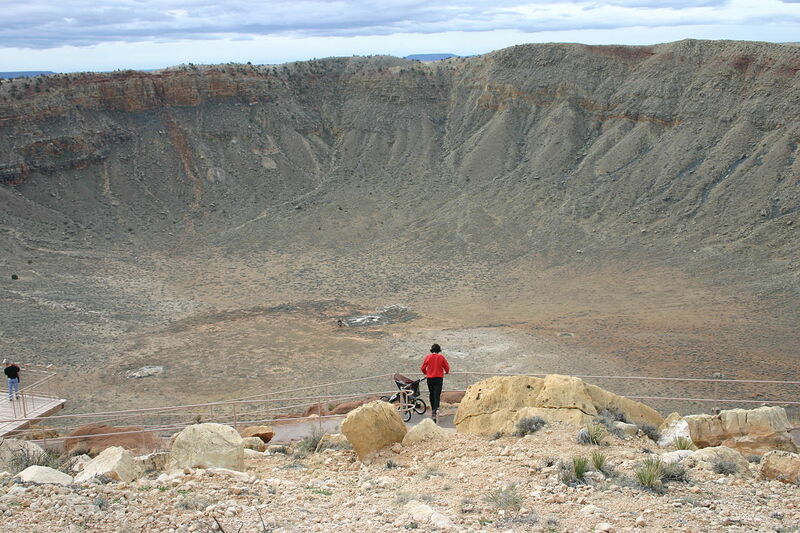 The crater is also privately owned by the Barringer family under the auspices of the Barringer Crater Company, which proclaimed the crater was the first proven and best preserved meteorite (crater) on the planet Earth. So far, this assertion remains unchallenged. 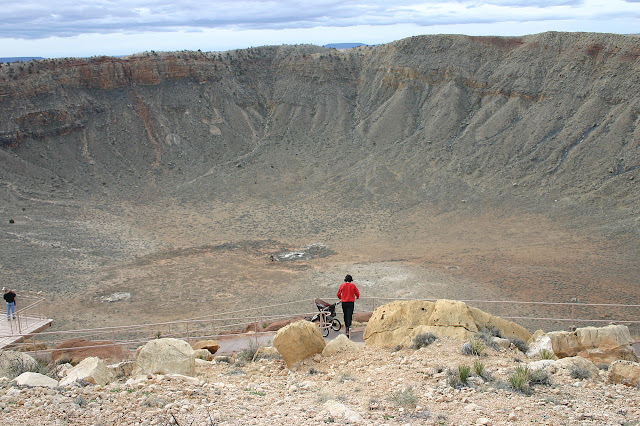 To date, there have been roughly one hundred and seventy impact craters discovered around the world. 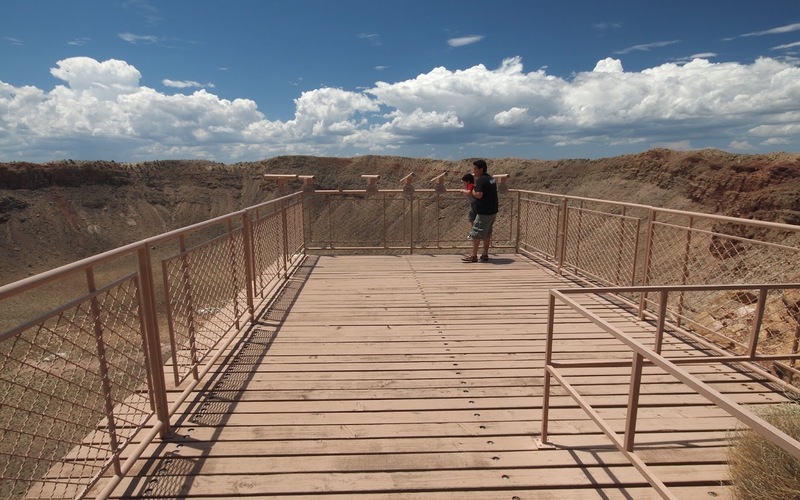 Apart from the previously mentioned dimensions, the center of the basin is filled with a depth of 700 to 800 feet (210–240 m) of spent rubble lying above the crater bedrock. One of the notable features of Meteor Crater is its squared-off outline. Believed to be caused by preexisting regional jointing (cracks) in the strata at the impact site, the deep impression was created during the span of the Pleistocene Epoch (2.5 million to 12,000 years ago) and marks a time when the climate on the Colorado Plateau was much cooler and more humid. Hence, the entire region was not the desert landscape we see today. Instead, the terrain was a vast, open grassland accented with woodland and marshy places. More than likely, no humans lived here though such primitive beasts as woolly mammoths and giant ground sloths freely roamed. The flash of the large, flaming object penetrating the atmosphere must have been frightening to these and other life forms that witnessed the spectacle. The nickel-iron meteorite that struck the ground with mega force was once estimated by scientists to be 54 yards (50 m) across. The speed was estimated at several kilometers per second. However, in recent years, the meteor's momentum has been a subject of debate. As a special note interest, initial modeling suggested the meteorite struck the ground at a speed of up to 45,000 miles per hour (equates to 20 kilometers per second) while more recent researchers suggest the impact was substantially slower, possibly closer to 28,600 mph (12.8 k.(go to page x)s.) is more accurate. There are also questions about the actual size of the meteor at the time of impact. For example, the later estimate of impact speed relies on the general assumption the meteor was roughly half the original size of 330,693 short tons in bulk (300,000 metric tons). Indeed, before this humongous cosmic derelict even struck the ground, the crater it left had already partially vaporized. Afterward, impact fragments were blown from the surviving mass, thereby very little of the original mass remains. The only physical evidence we have is the gaping impression. From Flagstaff, Arizona, take I-40 east, 43 miles (69 km), which for the sake of reference is about halfway between Winona and Winslow (Exit 233). The crater site is 6 miles (9.6 km) south of the interstate. The information contained within this webpage was taken from the mobile app based on my book Scenic Icons of the Southwest, which lists over 80 places such as this one. The app is available for free with the book. Follow me on Facebook and get a free mobile app that works in your browser. Rather have a real book instead? Interested in other books written by yours truly? CLICK HERE TO OPEN A UNIVERSE OF BOOKS FOR INQUISITIVE MINDS, LIKE YOURS!